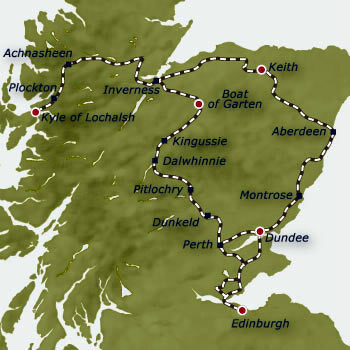 Scotch Malt Whisky Trail - In association with The Scotch Malt Whisky Society. As the world's foremost malt whisky club - specialists in single cask, single malt whiskies - The Scotch Malt Whisky Society is the perfect partner for this special Classic Whisky Journey through Scotland. Meet your whisky ambassador in the Balmoral Hotel and enjoy a welcome dram before departure. The train pulls out of Edinburgh station at 13:42 and travels north, crossing the Firth of Forth via the magnificent, 1.5-mile long Forth Railway Bridge, which was built by Benjamin Baker in the 1880s and is considered by many to be the eighth wonder of the world. It then proceeds through Fife and across the Tay Bridge - during which you are served a leisurely afternoon tea. A dram of whisky and a fascinating introduction into the world of Scotch will set the mood for the journey. The train continues east along the coast, passing through Carnoustie, Arbroath and Aberdeen before arriving in the market town of Keith in the heart of the Speyside whisky region. After an informal dinner relax over coffee in the Observation Car and enjoy traditional Scottish entertainment by local musicians. As the train leaves Keith you'll be enjoying a delicious breakfast. The next landmark is the Highlands' capital, Inverness, which you pass through before heading on to Muir of Ord where you disembark to visit Glen Ord distillery, one of the oldest in Scotland. Guests are treated to a private tour and a tasting and nosing session including an introduction to the smooth-tasting, 12-year-old Singleton of Glen Ord. Return to the train for another spectacular highlight - a delicious lunch, as the train heads towards Kyle of Lochalsh on what is arguably one of the most scenic routes in Britain. The line passes Loch Luichart and the Torridon mountains, which geologists believe were formed before life began. The train travels onwards through Achnasheen and then commences its climbs to Luib summit and Achnashellach Forest before descending to Strathcarron. The train then and runs along the edge of stunning Loch Carron, through Attadale, Stromeferry and Duncraig. Guests alight in Plockton to explore at will; perhaps take a boat trip to see wild seals or walk through the woodland to a viewpoint overlooking the loch, after which there is time to enjoy a dram or two in the Plockton Hotel, or choose to simply have a wander through this charming village. Return to the train and join in a specialist single cask whisky tasting in the Observation Car. Dinner is formal and afterwards coffee and liqeurs will be served in the Observation Car, which offers mesmerising views over Loch Alsh to the Isle of Skye. This morning, breakfast is served as the train travels east towards Carrbridge. Before lunch join your whisky ambassador in the Observation Car for a specialist single cask tasting. Lunch is served as the Belmond Royal Scotsman continues south to Carrbridge where guests disembark to visit Glenlivet Distillery, home of the iconic malt that inspired the Speyside region. The night is spent on board at Boat of Garten on the private Strathspey Railway. After a formal dinner, a Highlander regales guests with stories of local heroes and their derring-dos, even demonstrating some authentic weaponry. After breakfast, travel by coach n to Rothiemurchus Estate in the heart of the Cairngorms National Park, where guests can choose from activities such as fishing, clay pigeon shooting, a guided walk through the stunning landscape or simply relax with a warming dram by the fire. Rejoin the train at Kingussie where lunch will be served as you journey south through Blair Atholl and Pitlochry to Dunkeld. Disembark to visit Tullibardine Distillery in Blackford village. Join an in-depth VIP tour led by the distillery's master blender, offering nosing straight from the cask, a tour of the bonded warehouse and a tasting of a range of vintages. After rejoining the train in Perth, get dressed for a formal dinner on board. Overnight stay on board in Dundee. The infectious beat of the music tonight may inspire you to join some lively Scottish country dancing on the station platform, a fitting finale to your Classic Whisky Journey. Alternatively, round off your trip with an informal sampling of the Society's whisky range at the bar. After breakfast the train wends its way back through the former Kingdom of Fife to arrive in Edinburgh Waverley station at 09:46 where your journey ends. Sample Menu (Please note that this is a sample menu, not necessarily what will be served on your journey).